People look at the Globalport Batang Pier and see neon, more neon, Terrence, and more Terrence. 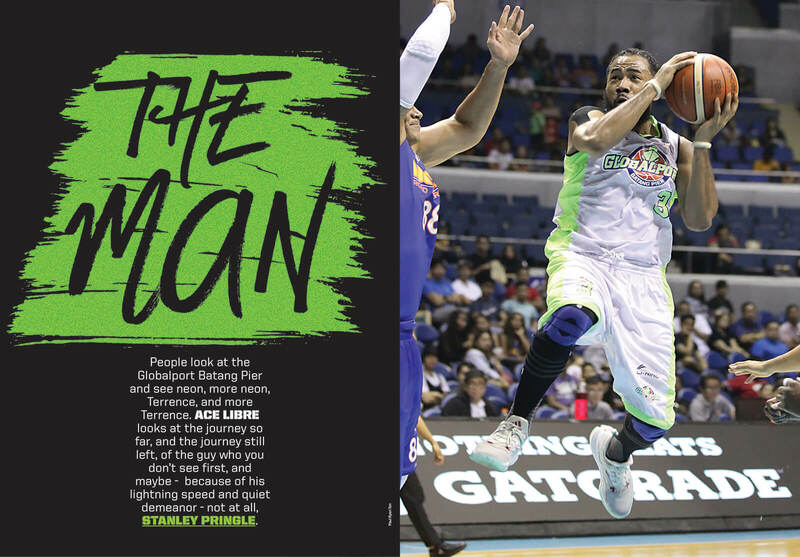 Ace Libre looks at the journey so far, and the journey still left, of the guy who you don’t see first, and maybe – because of his lightning speed and quiet demeanor – not at all, Stanley Pringle. They say lightning never strikes the same place twice. Pass that nugget of wisdom to the front office of the Globalport Batang Pier (GBP), however, and you might be met with smirks—even stifled laughter. When the neon green team picked Terrence Romeo, a dynamic guard with superstar DNA, in the 2013 PBA draft, it made sense to believe that the Batang Pier’s tryst with Lady Luck was decidedly over. The following year, they drafted California-born Stanley Wayne A. Pringle Jr., a Filipino-American guard who had put up numbers that screamed “First overall pick!” in nearly every league he played. It’s tempting to tag Pringle’s scoring mentality and ability to take over games as Romeoesque, just because former Far Eastern University Tamaraw entered the league first. But that would be a rookie mistake (pun intended). The Fil-Am baller came into the PBA after leaving burn marks in Europe and Asia, and continues to scorch opponents today. Stanley’s been doing Terrence Romeo things for longer than Terrence Romeo himself. And now, they’re wearing the same jersey colors. Lightning! One place, two strikes! No stranger to hoops excellence since he was young, Stanley Pringle’s eye-popping track record dates back to his playing days in Landstown High School, Pasco-Hernando State College, and Pennsylvania State University. Unsurprisingly, his skills translated into the pros. He averaged 12.3 points, 3.3 rebounds, 2.5 assists, and 2.4 steals per game in the Polish Basketball League; 15.0 points, 4.6 rebounds, 3.5 assists, 1.3 steals per game in the Ukrainian Basketball SuperLeague; 18.6 points, 4.8 rebounds, 6.2 assists per game in the ASEAN Basketball League—to go along with a championship. The numbers appear as though the Penn State alumnus figured out how to hack the Matrix, and has rigged the system in his favor. If one thing’s for sure, it’s that players who can acclimate and thrive in diverse contexts, are difficult to come by—particularly if differences in customs, language, and style of play across countries, let alone continents, are involved. But more plausible than the Matrix theory, is the idea that basketball and—to a greater extent—competitive drive, transcend borders and the cultural mores within them. Perhaps Pringle’s transnational success can be attributed to an insatiable drive to one-up himself, and everyone else. Maybe it’s as simple as that. His per-game average of 14 points, 6.1 rebounds, 3.9 assists, and 1.5 steals won him the Rookie of the Year award, a spot in the PBA All-Star Game, All-Rookie Team, Mythical Second Team, in 2015. The cautionary tale of the first overall draft pick crumbling under the weight of expectation and scrutiny, is not an unfamiliar narrative. In Stanley’s case, age and experience weaken the “Could he end up a bust?” scenario, because he had already proven himself several times before. Still, living up to the hype and impressing despite the pressure (if he felt any pressure at all) cannot be denied. Let’s entertain the idea for a moment. Is it still possible for him to bust out somewhere down the road? It’s possible, but unlikely. The biggest game-changer would probably be a major injury, but otherwise, he’ll keep balling. Would he have racked up all those accomplishments as a “rookie,” if his mindset was simply to not fall short of expectations? To not fail? Also possible, also unlikely. The shooting guard showed Filipinos what he was about, right out of the gate. Each drive, blow-by, dish and trey, concretized the reputation that had preceded him. It was as if a ready-made legend was broadcasting his own arrival. 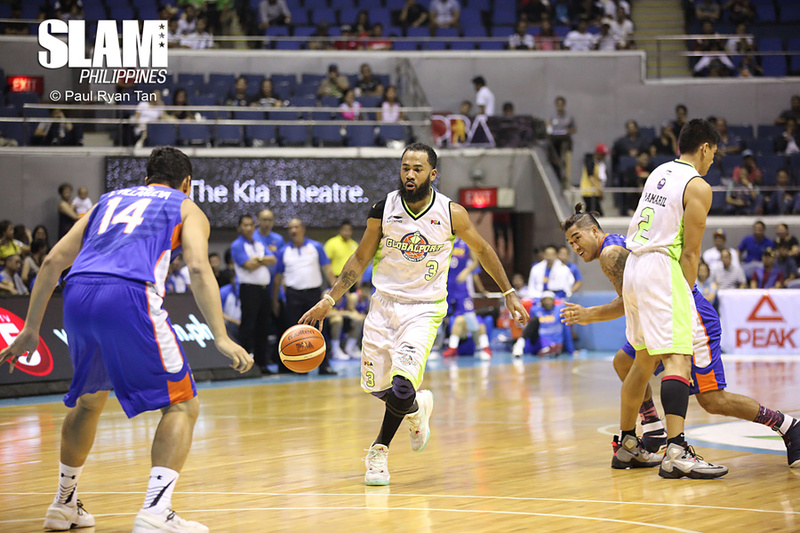 Globalport lost the game—Pringle’s PBA debut—to the NLEX Road Warriors, but gained the assurance that their bearded recruit was for real. It turns out that that first game was a microcosm of Globalport’s immediate future; let Pringle (and Romeo) carry the Neon Nation on their backs, and see what happens. “He is one of the leaders that guides (his) teammates and carries the scoring load when they’re down,” says Alena Abesamis, a social media administrator for the Globalport Army, and Batang Pier fan. She sees him as one of the strongest players on the team. He was one of the three scoring guards, for at least his first couple of months in the PBA. Championing the on-court combination of Pringle, Romeo and veteran Alex Cabagnot, as a “three-headed monster,” team owner Mikee Romero inevitably raised more questions than answers. “I think Terrence, Alex and Stanley should learn to co-exist,” he said in 2014. Romero’s acute mastery of logic aside, each head of the “monster” had built his game on creating shots off the dribble, shooting from beyond the arc, and making plays for teammates. Arguably in that order. Pundits questioned the Batang Pier’s chemistry, citing each guard’s ball dominance as the glaring obstacle to team cohesion. Baclao deserves praise for his optimistic take, but history seems to push in the opposite direction. GBP eventually shipped Cabagnot to the San Miguel Beermen, in exchange for Sol Mercado. They virtually hit the “Undo” button on the trade involving the same players, and the same teams, that occurred earlier in the same year. This left the Filipino basketball world baffled. That Cabagnot allegedly insisted on getting traded, was the cherry atop the contrarian cake. 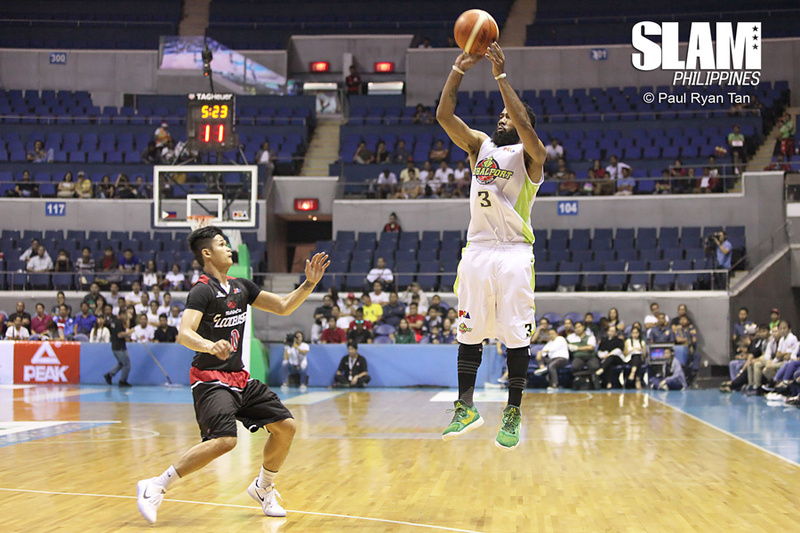 The Batang Pier finished the 2014-2015 Philippine Cup with a 5-6 win-loss record. For the uninitiated, “Slash Brothers” is a play on “Splash Brothers,” the original title given to the Golden State Warriors’ sharpshooting backcourt tandem in Stephen Curry and Klay Thompson. 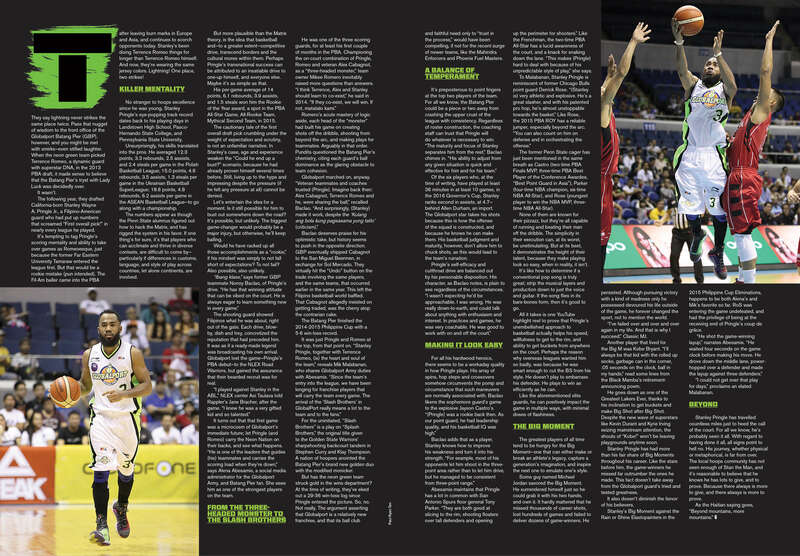 A nation of hoopers anointed the Batang Pier’s brand new golden duo with the modified monicker. But has the neon green team struck gold in the wins department? At the time of writing, they’ve eked out a 29-36 win-loss log since Pringle entered the picture. So, no. Not really. The argument asserting that Globalport is a relatively new franchise, and that its ball club and faithful need only to “trust in the process,” would have been compelling, if not for the recent surge of newer teams, like the Mahindra Enforcers and Phoenix Fuel Masters. Of the six players who, at the time of writing, have played at least 36 minutes in at least 10 games, in the 2016 Governor’s Cup, Stanley ranks second in assists, at 4.7—behind Allen Durham, an import. The Globalport star takes his shots because this is how the offense of the squad is constructed, and because he knows he can make them. His basketball judgment and maturity, however, don’t allow him to chuck shots, as this would lead to the team’s ruination. Abesamis maintains that Pringle has a lot in common with San Antonio Spurs floor general Tony Parker. “They are both good at slicing to the rim, shooting floaters over tall defenders and opening up the perimeter for shooters.” Like the Frenchman, the two-time PBA All-Star has a lucid awareness of the court, and a knack for snaking down the lane. “This makes (Pringle) hard to deal with because of his unpredictable style of play,” she says. The former Penn State cager has just been mentioned in the same breath as Castro (two-time PBA Finals MVP, three-time PBA Best Player of the Conference Awardee, “Best Point Guard in Asia”), Parker (four-time NBA champion, six-time NBA All-Star), and Rose (youngest player to win the NBA MVP, three-time NBA All-Star). None of them are known for their pizzazz, but they’re all capable of running and beating their man off the dribble. The simplicity in their execution can, at its worst, be unstimulating. But at its best, it demonstrates the height of their talent, because they make playing look so easy, when in reality, it isn’t. It’s like how to determine if a conventional pop song is truly great; strip the musical layers and production down to just the voice and guitar. If the song flies in its bare-bones form, then it’s good to go. All it takes is one YouTube highlight reel to prove that Pringle’s unembellished approach to basketball actually helps his speed, willfulness to get to the rim, and ability to get buckets from anywhere on the court. Perhaps the reason why overseas leagues wanted him so badly, was because he was smart enough to cut the BS from his style. He doesn’t play to embarrass his defender. He plays to win as efficiently as he can. Like the aforementioned elite guards, he can positively impact the game in multiple ways, with minimal doses of flashiness. The greatest players of all time tend to be hungry for the Big Moment—one that can either make or break an athlete’s legacy, capture a generation’s imagination, and inspire the next one to emulate one’s style. Some guy named Michael Jordan savored the Big Moment. He surrendered himself just so he could grab it with his two hands, and own it. It hardly mattered that he missed thousands of career shots, lost hundreds of games and failed to deliver dozens of game-winners. He persisted. Although pursuing victory with a kind of madness only he possessed devoured his life outside of the game, he forever changed the sport, not to mention the world. “I’ve failed over and over and over again in my life. And that is why I succeed.” Classic MJ. Another player that lived for the Big M was Kobe Bryant. “I’ll always be that kid with the rolled up socks, garbage can in the corner, :05 seconds on the clock, ball in my hands,” read some lines from the Black Mamba’s retirement-announcing poem. He goes down as one of the Greatest Lakers Ever, thanks to his inclination to get buckets and make Big Shot after Big Shot. Despite the new wave of superstars like Kevin Durant and Kyrie Irving seizing mainstream attention, the shouts of “Kobe!” won’t be leaving playgrounds anytime soon. Stanley Pringle has had more than his fair share of Big Moments throughout his career. Like the stars before him, the game-winners he missed far outnumber the ones he made. This fact doesn’t take away from the Globalport guard’s tried and tested greatness. It also doesn’t diminish the fervor of his believers. Stanley’s Big Moment against the Rain or Shine Elastopainters in the 2015 Philippine Cup Eliminations, happens to be both Alena’s and Mik’s favorite so far. RoS was entering the game undefeated, and had the privilege of being at the receiving end of Pringle’s coup de grâce. “I could not get over that play for days,” proclaims an elated Malabanan. Stanley Pringle has travelled countless miles just to heed the call of the court. For all we know, he’s probably seen it all. With regard to having done it all, all signs point to hell no. His journey, whether physical or metaphorical, is far from over. The local hoops community has not seen enough of Stan the Man, and it’s reasonable to believe that he knows he has lots to give, and to prove. Because there always is more to give, and there always is more to prove.